Niematian village in Al-Muglad area of West Kordofan State shares many similarities with other neighbouring villages and towns in the province, where crop-farming, grazing and small-scale trade are the mainstays of the local economy. Pastoralists of West Kordofan were greatly affected by the 2011 secession of South Sudan, which hindered them from crossing the border as they had done previously in search of pasture and water for their herds. This has led to concentration of livestock in the already fragile grazing areas in the state, overgrazing around permanent water points and potential conflict with farmers, spread of diseases and livestock death. Niematian has also experienced a considerable population increase, arising mainly from displaced communities from the Hamar tribe, in the state’s North Babanusa area, and Dinka refugees from South Sudan and the disputed region of Abyei. This rapid population growth, coupled with failing environmental governance structures, has fuelled environmental degradation. It has also spurred tensions and conflict over land, which on many occasions have resulted in violence. 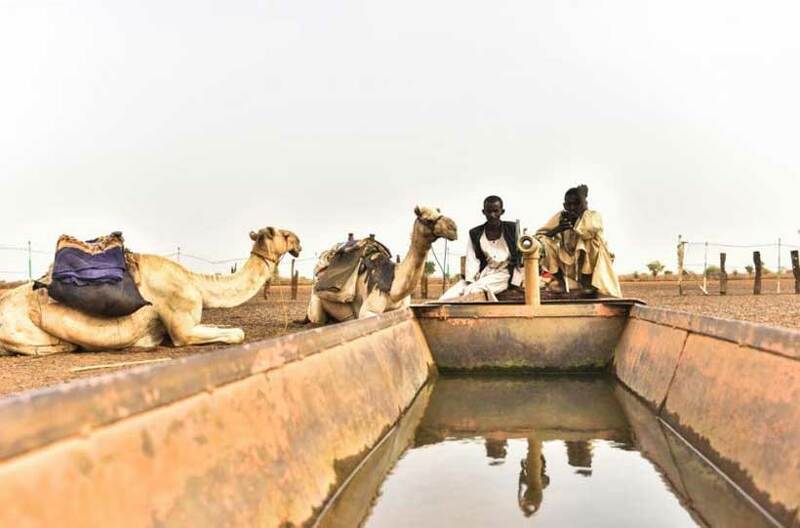 Between June 2015 and August 2018, UN Environment, with funding from the European Union, implemented the Promoting Peace Over Natural Resources in Darfur and Kordofan project. The project aimed to improve the capacity to resolve resource-based conflicts and to manage natural resources more sustainably and equitably. The 39-month project was implemented across five areas in West Darfur (Kerenik and Mornie), Central Darfur (Azum) and West Kordofan (Muglad and Babanusa). It was delivered in partnership with two national non-governmental organizations: the Darfur Development and Reconstruction Agency (DDRA) in West and Central Darfur, and SOS Sahel Sudan (SOS Sahel) in West Kordofan. In 2016, there was an unprecedented situation in Niematian village after farmers expanded their agricultural fields and encroached agreed migratory routes, thus denying pastoralists access to water for themselves and their livestock. However, thanks to a local reconciliation committee, the dispute was managed and the tension diffused in a thoughtful and reliable way. “To prevent similar conflicts in future, a peace forum was held in Niematian village January 2017 with the support of SOS Sahel. Community and tribal leaders briefed communities on the forum’s objective and invited five members from each of the 18 sub-villages along the central migratory route to participate in the peace forum,” says Atila Uras, UN Environment’s Sudan Country Programme Manager. The local administration brought together leaders of the tribes in conflict to not only jointly identify violations but to also explore ways to strengthen relations between them. The Niematian reconciliation committee, which comprised local leaders from the Dinka, Hamar and Misseriya tribes, continues to resolve conflicts over land use in accordance with customary law. Furthermore, through a seasonal agricultural committee, which is activated during the rainy season, the tribal leaders in Niematian have been implementing the taleg, traditional rules and customs, to allow free access to crop residue by pastoralists after the collection of harvest by farmers. “As a result of the forum, and the consequent dialogue, we witnessed a 60 per cent reduction in conflict,” says Bashtanah Mohamed Salim, a local leader from the Misseriya tribe who played a key role in establishing the Niematian peace forum in 2017. Thanks to the project, conflict resolution training was provided to both local government officials and tribal leaders in all the three states. In West Kordofan State, the training was delivered in collaboration with the Peace and Development Studies Centre in the state capital Al Fula. It provided tailored guidance on conflict analysis, carrying out risk assessments to intervene prior to conflict, and communications and mediations skills. Between 2009 and 2015, the programme co-generated 150 original peer-reviewed case studies by 225 experts and practitioners, covering 12 natural resource sectors across 60 conflict-affected countries. It also provided technical analysis and environmental diplomacy support to Western Sahara, Haiti, the Dominican Republic, Papua New Guinea, the Sahel region, Sudan and Nigeria to address ongoing or potential resource disputes. In February 2015, the United Nations Department of Political Affairs and UN Environment jointly published Natural Resources and Conflict: A guide for mediation practitioners.